But also, NOT oops, because you don't, like, accidentally sew a dress. ANYWAYS, the material for this whole dress cost $15, and it only took five hours. Although it has a chevron pattern all over it, it's pink on pink so it basically reads as a solid. And Solids = Basics. I drafted the pattern myself. The material is a super thick bright pink jersey that I found on sale at Fabricland, buried under some other bolts in the back corner for $5/metre. Bargain! Maxi dresses totally cost more than $100 normally. 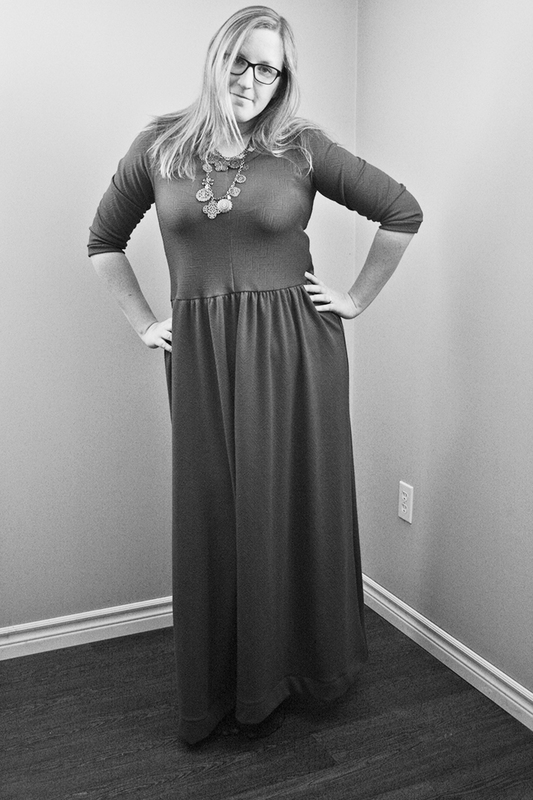 I made long sleeves because it's winter and I need a wintery, warmer maxi dress. I meant to add pockets but I forgot and now that I see it on, my hips really don't need some more material at the sides, so I think I will leave it. I was on the fence about having a gathered skirt, for these same hip reasons, but in the end I couldn't help myself. I love gathered skirts! Even long sleeved dresses need a sweater, people. Because sweaters and a cup of tea make everything better. Also, possibly I need an intervention because I can't stop sewing things. I made Jay a shirt, and myself a T-Shirt, a Maxi Dress, and a bathing suit. SINCE LAST WEEK. I'm going to try and slow it down now and spend more time PLANNING what I want to make. Which I think will be a mustard yellow and white striped button down... just need mustard and white striped fabric.